I was recently interviewed by a French travel site called France Japon and I’m happy to say that the interview has now been published. It concentrates mostly on my photography and my relationship with Japan so it might be of interest to the readers of my blog. Unfortunately it’s all in French, but I’ve sent them some photos from Japan that I haven’t published anywhere else yet, so go take a look even if you don’t speak French! 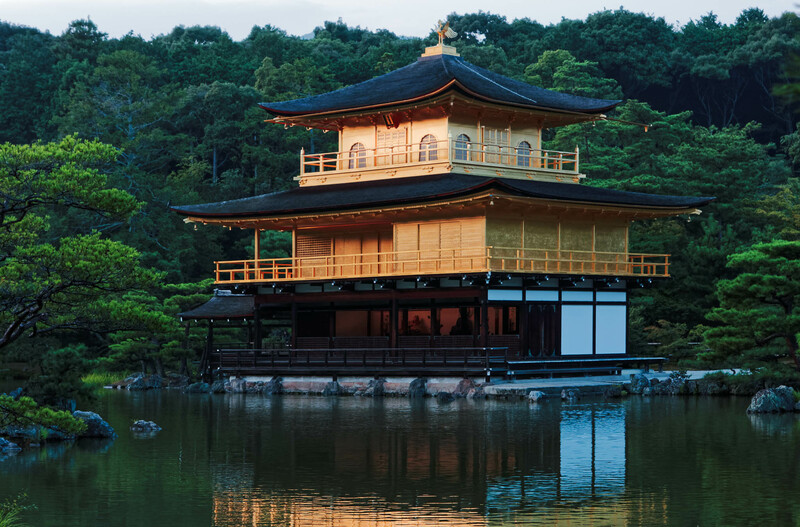 Here’s one more image of the Kinkakuji temple in Kyoto. I wanted to post this separately as I felt that the Kyōko-chi pond (the Mirror Pond) deserved attention. 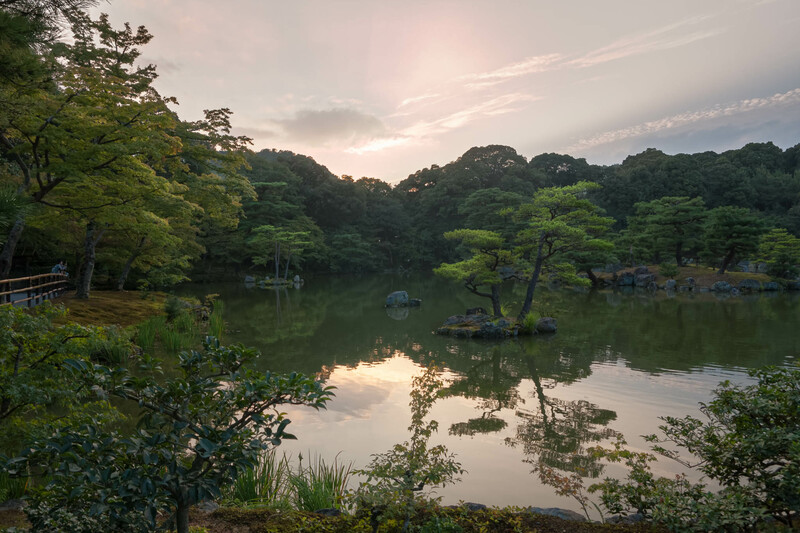 The reason the pond, designed in the Muromachi period, is called the name Mirror pond is that it reflects the Golden Pavilion. It contains 10 small islands, which according to Wikipedia represent famous places in Chinese and Japanese literature, and it seems that the surroundings of the pavilion were built according to descriptions of the Western Paradise of the Buddha Amida, the largest islet representing the Japanese islands. 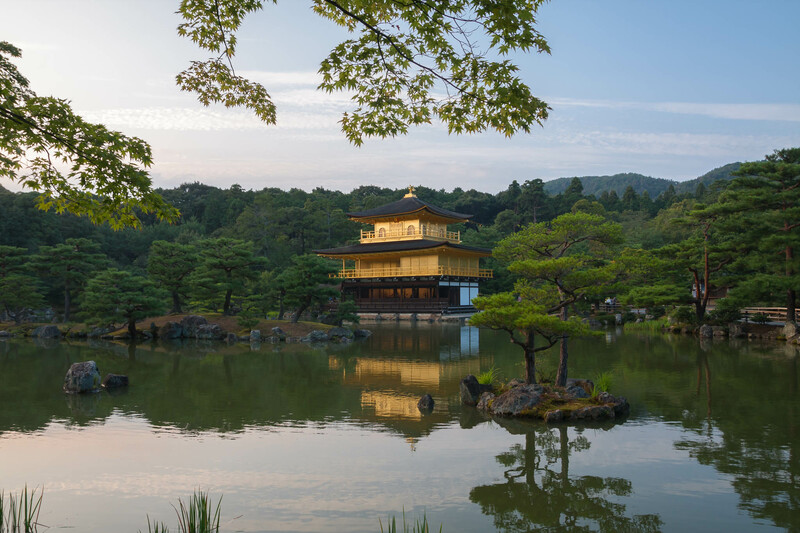 Even though you weren’t interested in the history of the pond, there’s no denying that the golden pavilion wouldn’t be half as spectacular without the carefully designed pond that really makes the building shine. There’s a time for words and a time for images, and now’s the latter. I already wrote about the Rokuonji temple in a previous post so I won’t go into detail about its history anymore. 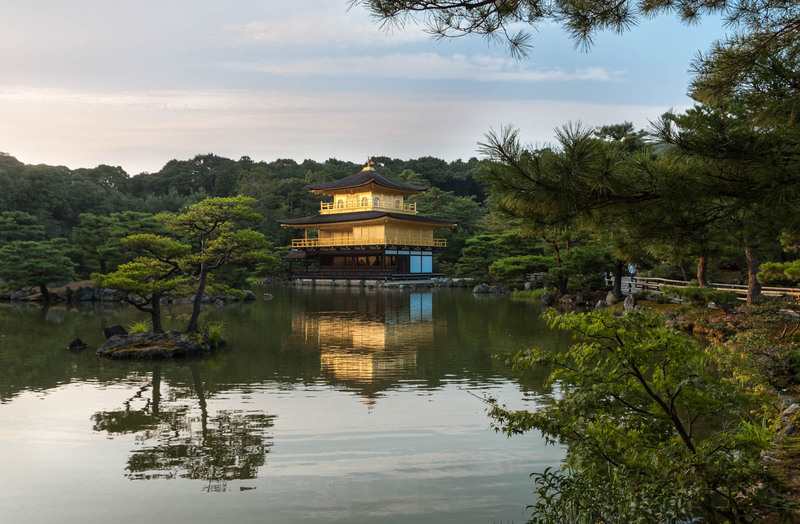 Instead I decided to show the temple’s main attraction, Kinkaku, the golden pavilion from different angles that you see when you walk around the pond and the temple area. I was extremely lucky that the evening when I visited the temple turned out so beautiful. I hope you enjoy these images! 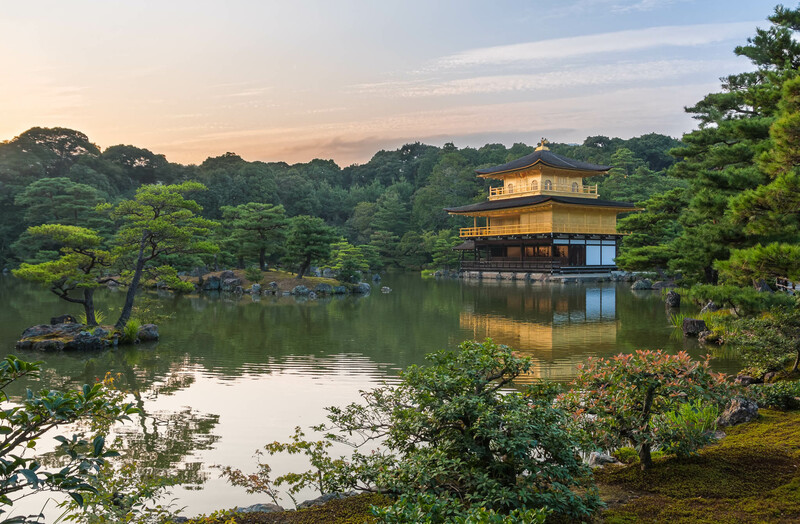 After a quick tour at the Nijo Castle, we headed to the final destination of the day, the famous Kinkakuji temple or the Temple of the Golden Pavilion. 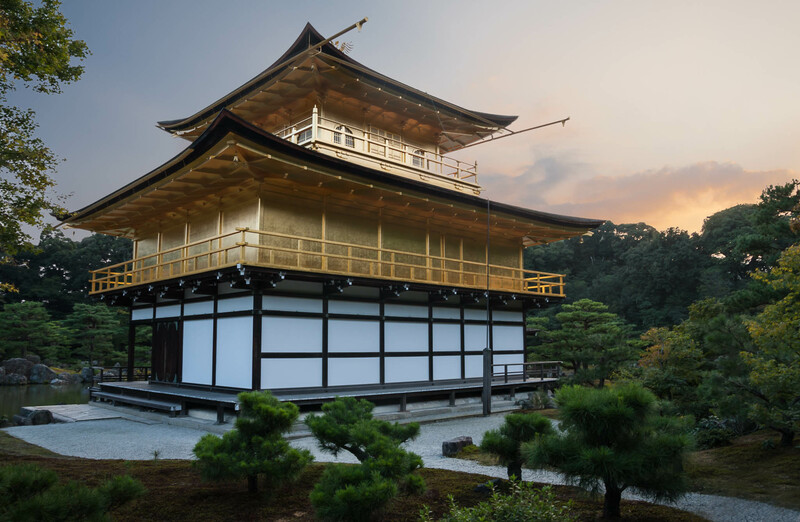 The official name of the temple is Rokuonji, but Kinkakuji has become the more common name for it. it is probably one of the most famous buildings in Kyoto, and also one of the city’s World Heritage Sites. 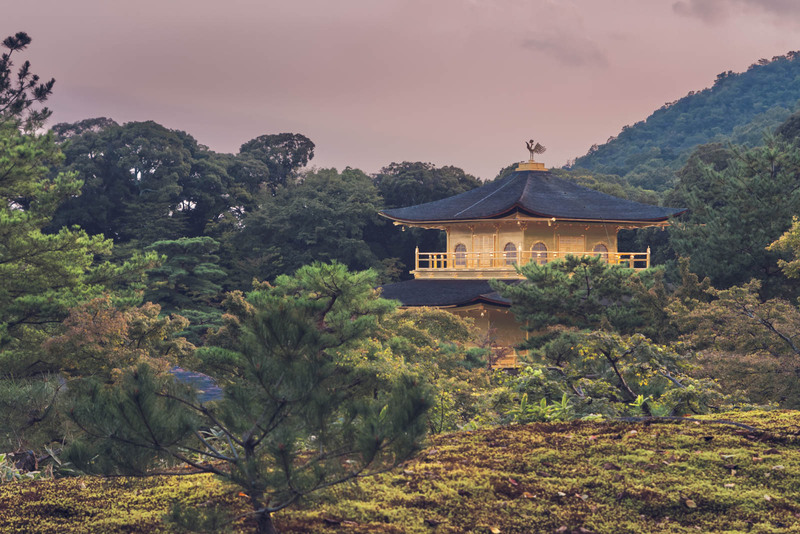 And like many other temple’s in Kyoto, Kinkakuji too was burned down by a monk, although the arson at Kinkakuji took place as late as the 1950s. The top floor of the Pavilion is covered with leaf gold, and the architecture of each floor is different. There’s a detailed description of the temple in Kinkakuji in Wikipedia, so I’m not going to copy and paste the article here in its entirety. What I like about the temple site even more than the temple though, is the garden around the temple. If you happen to go there when the number of tourists is low, it is a quiet and relaxing environment. We visited the temple in early October and entered about 15 minutes before the closing time, which meant that most of the visitors had already left and because the trees had not yet changed to autumn colors, it wasn’t the peak tourist season. We walked around the area taking photos until a guard ushered us out, but it wasn’t until 25 minutes after the closing time that we actually left the area. I’ve also visited Kinkakuji in winter (early February), and because Kyoto gets a bit chilly in winter (not really, if you’re a Finn), there weren’t a lot of visitors then either. It also happened to snow that time so I got to see Kinkakuji covered in snow. So, although Kyoto’s temple’s are beautiful in autumn and the climate is really pleasant then, I wouldn’t shy away from visiting Kyoto during other seasons either. 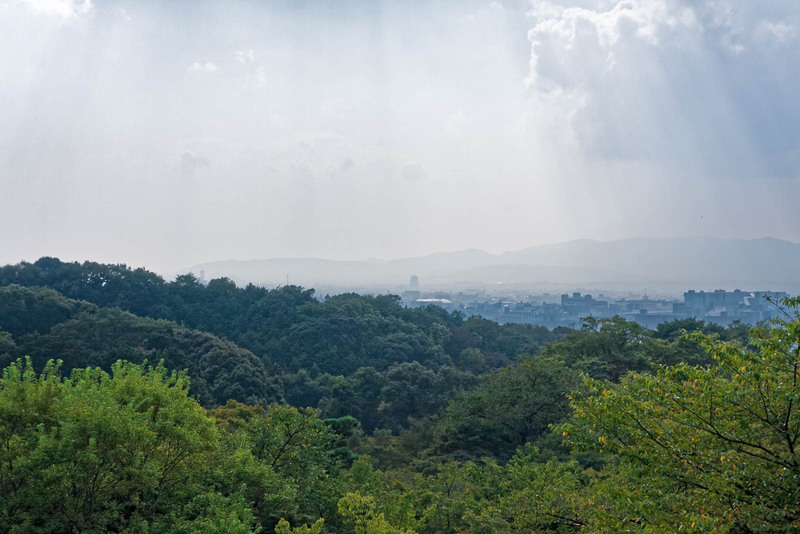 If the view of Kyoto I posted earlier is a classic view from Kiyomizudera, this one is downright iconic. 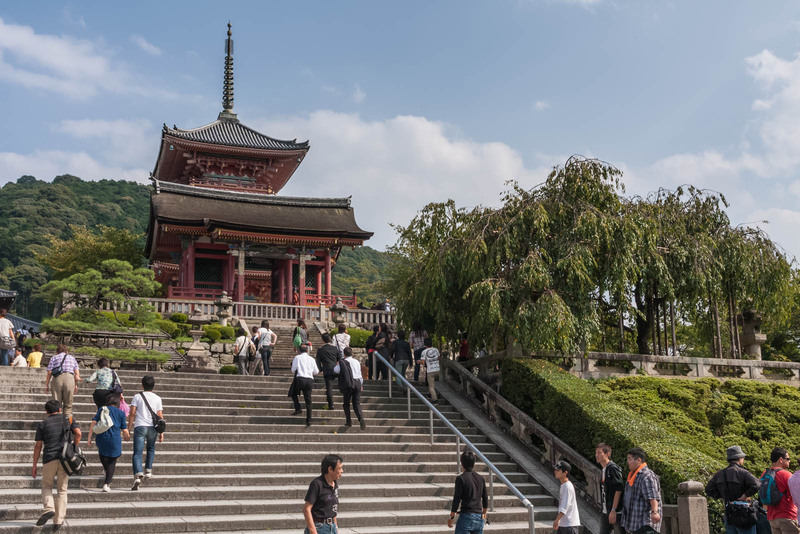 You can see the Kiyomizudera temple and its three-story pagoda from this angle from the viewing platform right next to the Oku-no-in hall. With this image I wanted to go the traditional route without subtle post-processing and make the image look as glorious as the view was. That’s one thing I love about digital photography – with just a bit of retouching I was able to bring back the lush green of the foliage and dig out the clouds and the mountains from the original raw photo where the sky looked like it was covered in white haze. Which, of course was not, what the scene looked like when I was there – or how I want to remember it. I took a longer-than-expected break from the blog and social media in general, but I’m back and have loads of new images to upload. 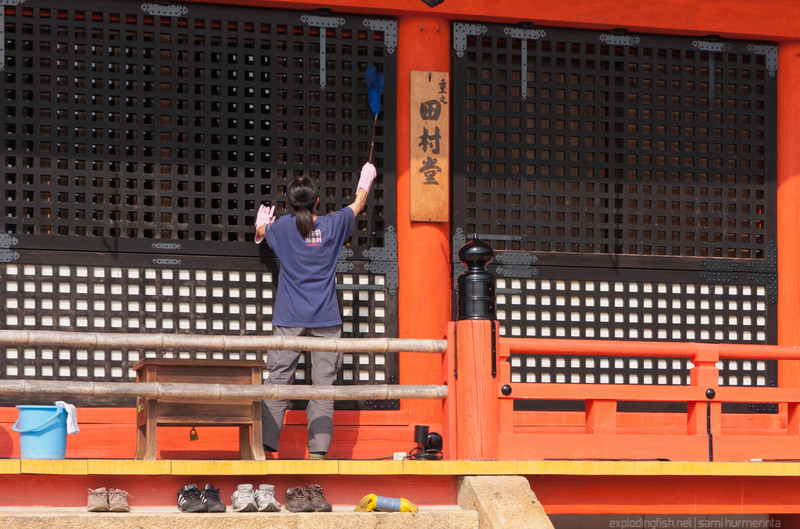 I’ll start with a bunch of photos from the famous Kiyomizudera temple in Kyoto, but before we get to the images, I have some housekeeping to do: the print contest is over and the winner has been notified. I’m already planning the next giveaway, so stay tuned! 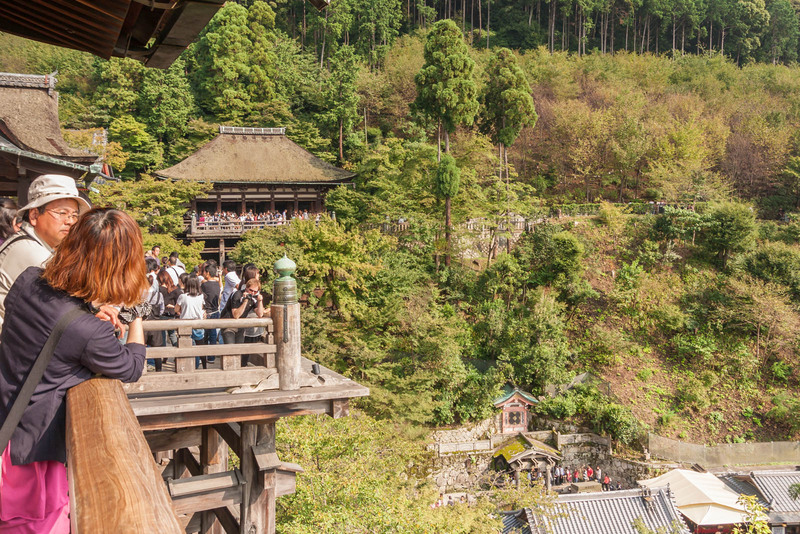 I don’t do massive image posts like this often, but I though the Kiyomizudera temple requires one – and even with this amount of images I think I only managed to show a fraction of the temple area, so there’s definitely another Kiyomizudera post coming up later. 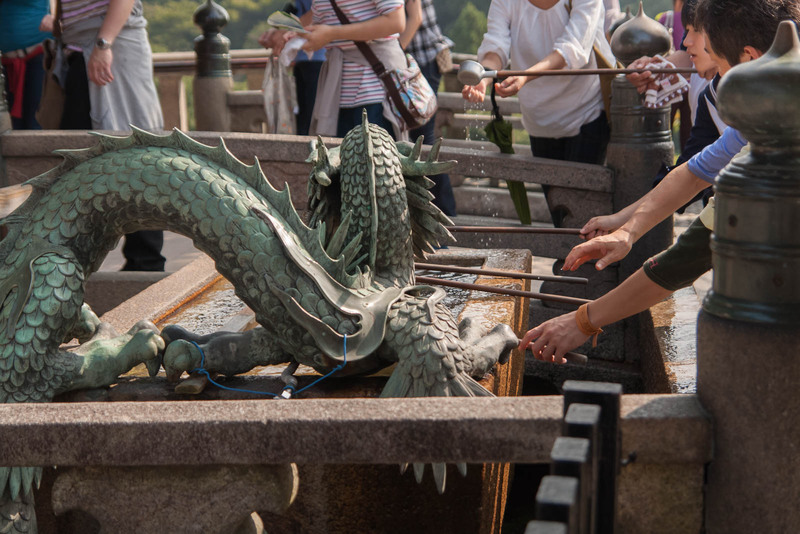 Kiyomizudera (Pure Water Temple) is an independent Buddhist temple established in 798 and one of Japan’s many UNESCO world heritage sights. The current buildings, however, only date back to 1633. This is when Tokugawa Iemitsu ordered restoration of the Temple. The original buildings had been destroyed long before in fires – many of which were started by monks from rivaling temples who were trying to manually enlighten their brothers. An interesting point in the architecture of the temple is that not a single nail has been used in building it. I’m sure though that the builders have hammered down one nail somewhere in the building just for the hell of it. 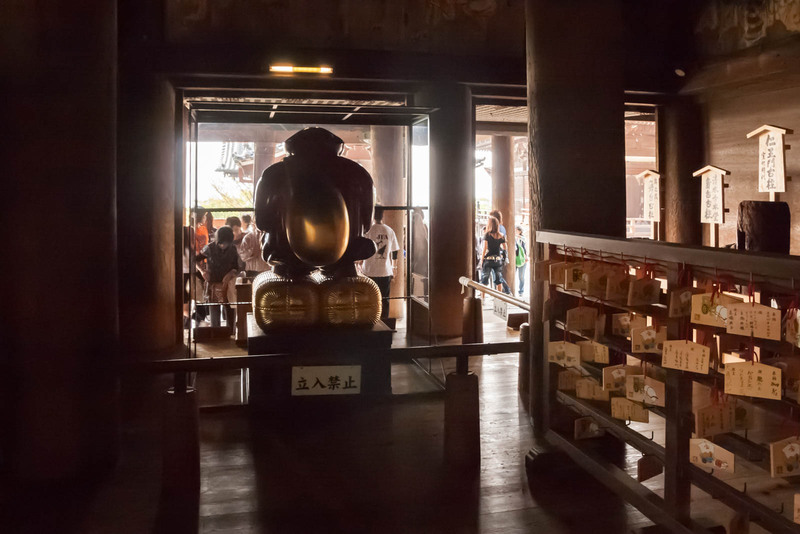 Unlike most other Buddhist temples, Kiyomizudera incorporates shinto shrines. Probably the most well known of them is a shrine is called Jishu shrine, which is dedicated to a god of love and good matches. Near the shrine there are two stones called “love stones”. They are located a few meters apart and people believe that if you can walk from one stone to another with your eyes closed, you’ll be lucky in love. Based on my personal experience it doesn’t work. I don’t know how often these old buildings are cleaned, but we happened to see one called Tamura Hall being brushed by two workers. 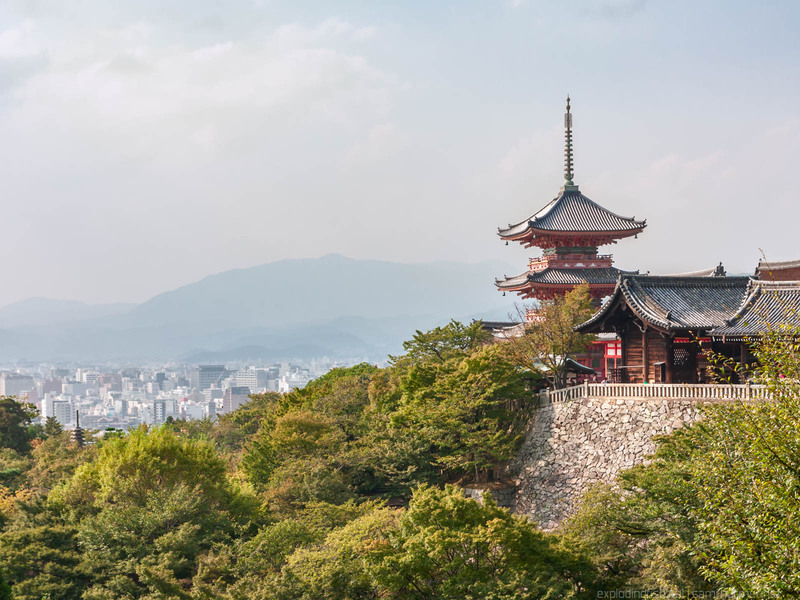 One of the attractions of Kiyomizudera is a stage built on 13-meter-tall scaffolding, which offers a magnificent view to Kyoto. The view is not, however, the only thing that attracts people to the stage. 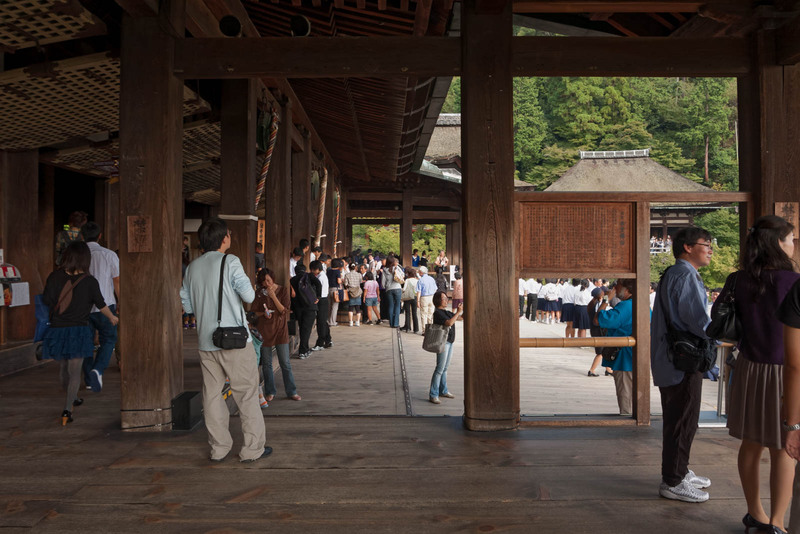 It seems that during the Edo period the veranda also attracted jumpers, who believed that if they survived the fall they would gain luck for the following year. According to Wikipedia, 234 people plunged off the stage between 1694 and 1864 and the survival rate was 85,4 percent. Fortunately no one jumped while we were there! 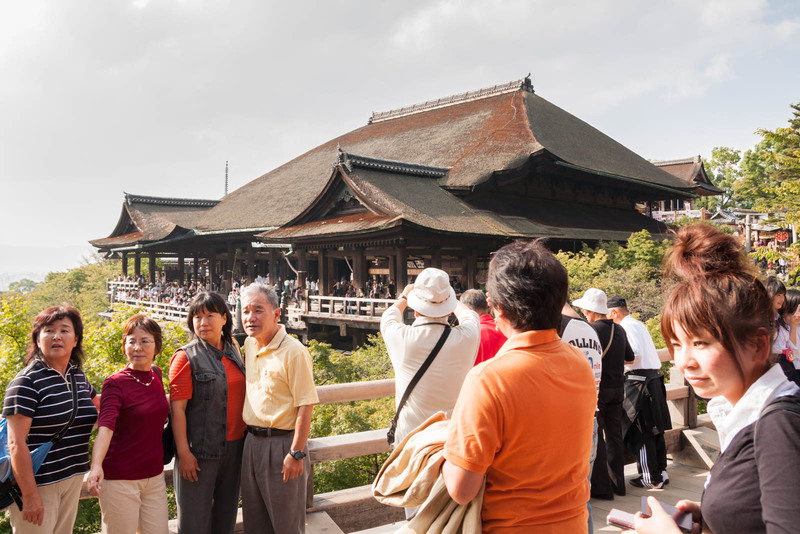 The full name of Kiyomizudera temple is Otowasan Kiyomizudera (The pure water temple of Mount Otowa). 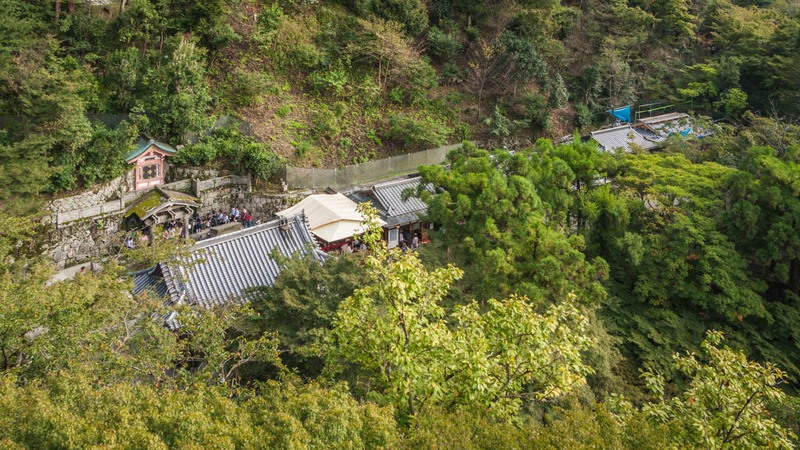 The temple gained its name from the Otowa waterfall that runs down from a mountain near the temple. 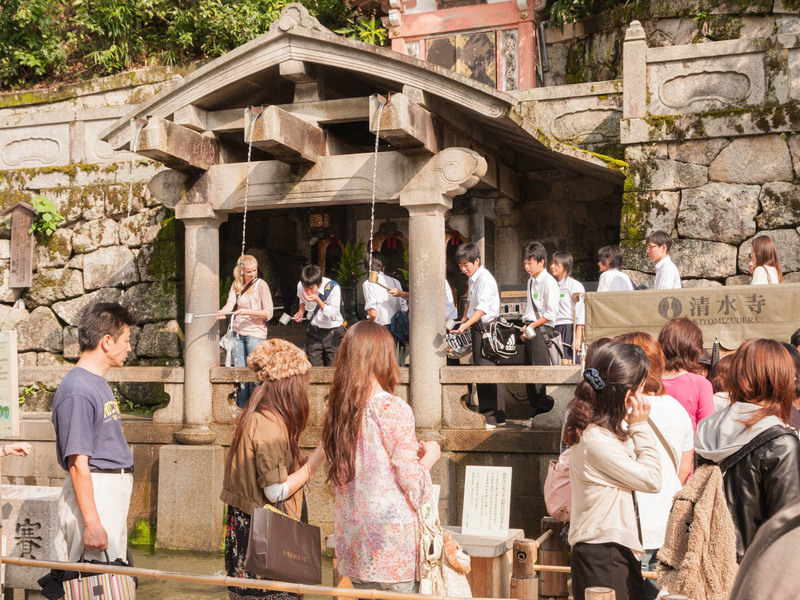 The water from the waterfall has been divided into three streams and it is believed that by drinking from these streams you can gain wisdom, longevity, or luck in matchmaking. It’s also believed that if you’re greedy and drink from all three streams, you invite bad luck. 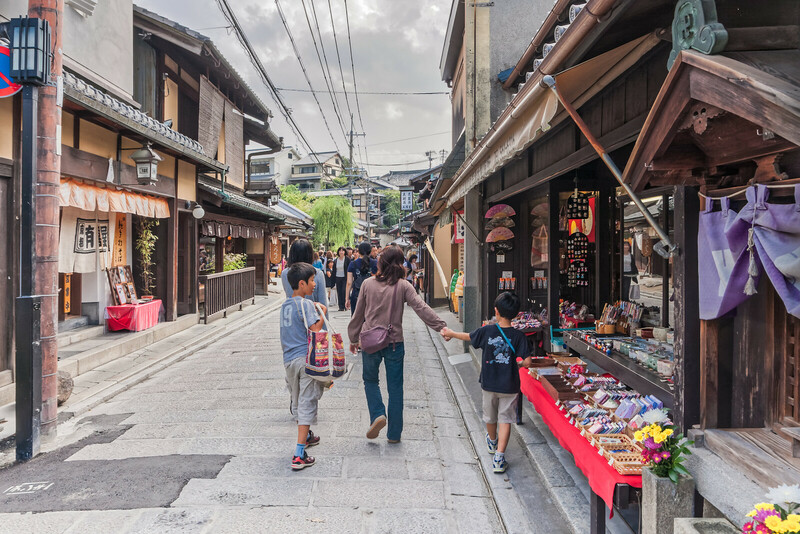 I haven’t done a longer photo post in ages so instead of writing about the streets of Higashiyama, I decided to show them. 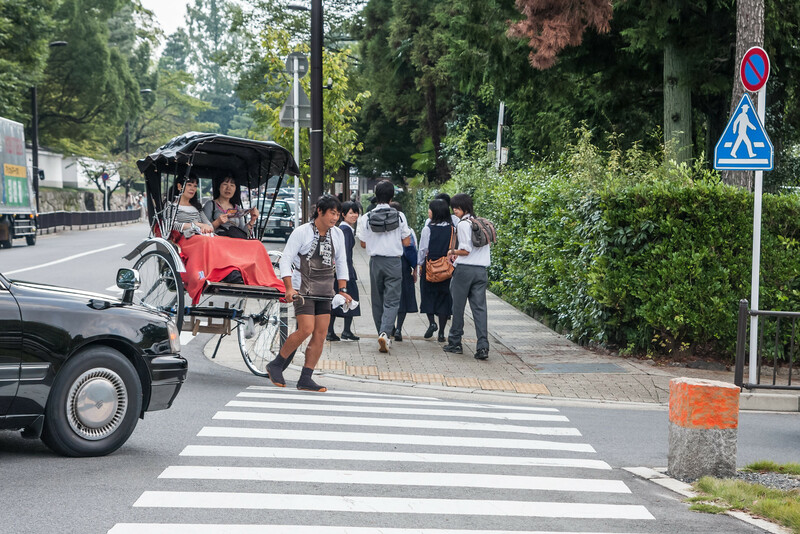 These are shots from the Higashiyama area in Kyoto, taken between a relatively short distance from the Jingu Michi road to Kiyomizudera temple. The gate in the above photo is Sanmon, the great gate of the Chion-in temple, the headquarters of Jodo Buddhism (the Pure Land Sect). Many of the remaining buildings at Chion-in date back to 17th century, including the the Sanmon gate, which was built in 1619. Standing 24 meters tall the gate is the largest surviving structure of its kind in Japan and a classified as a national treasure. We passed by the temple this time, so I can’t give you a detailed description of it, but I probably wouldn’t be able to tell you any more about it than Chion-in temple in Wikipedia anyway. From Chion-in we continued through Maruyama park. After the park we came to a street called Nene no michi (Nene’s path). 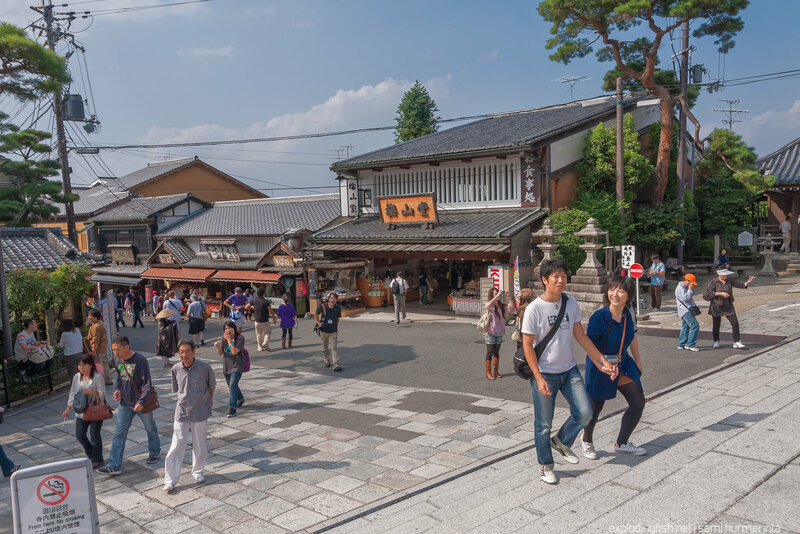 The street is named after Toyotomi Hideyoshi’s wife Nene, who became a nun after Toyotomi’s death and had the Kōdaiji temple built to commemorate her husband. Nene no michi is said to be the route that she walked every day to her husband’s grave. 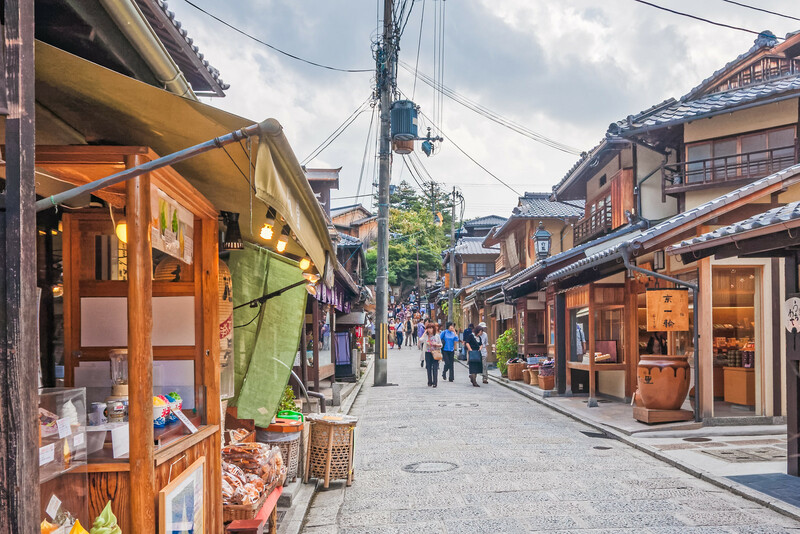 The architecture in this area is traditional and unlike most of Japan, there are no visible telephone wires and cables in the area. The following two images are from the area around Ninenzaka, where the street is lined with small shops and tea houses. 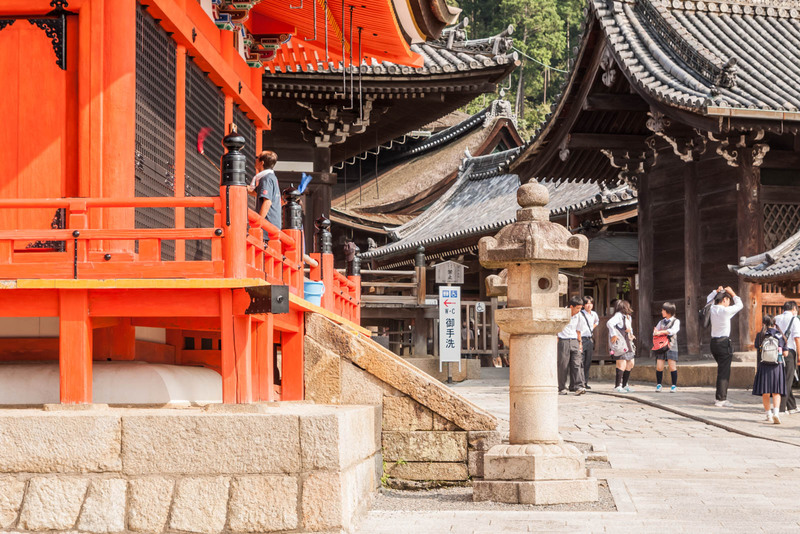 It’s a perfect area for a stroll if you are interested in the the temples, shrines and other traditional architecture. 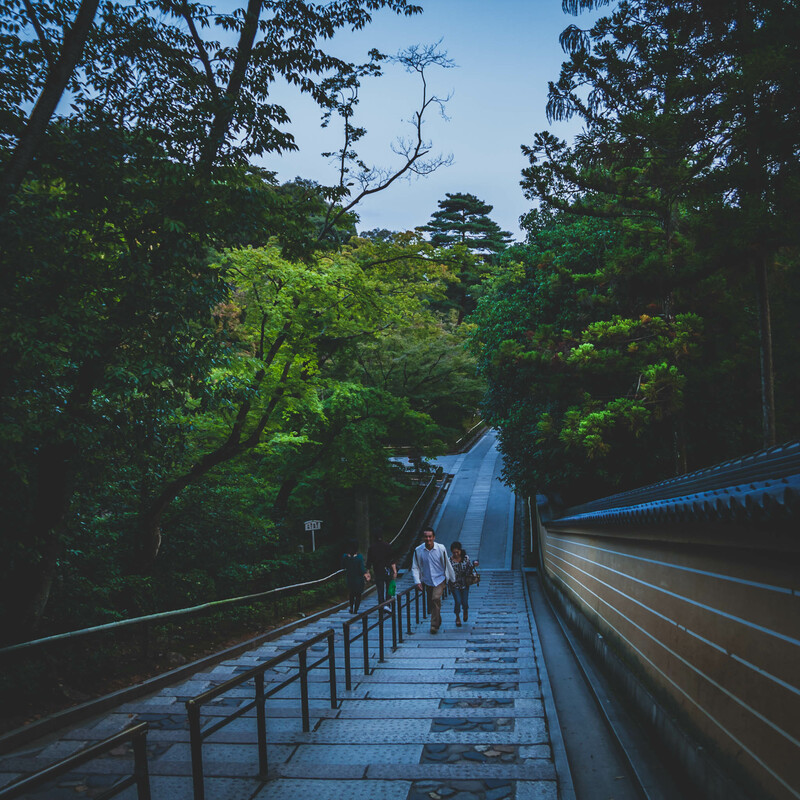 The final photo is from the stairs leading up to the Kiyomizudera temple. In the next post I’ll show you a few images from the temple grounds. Meanwhile, participate in my print giveaway to win a unique fine art print of one of my images! 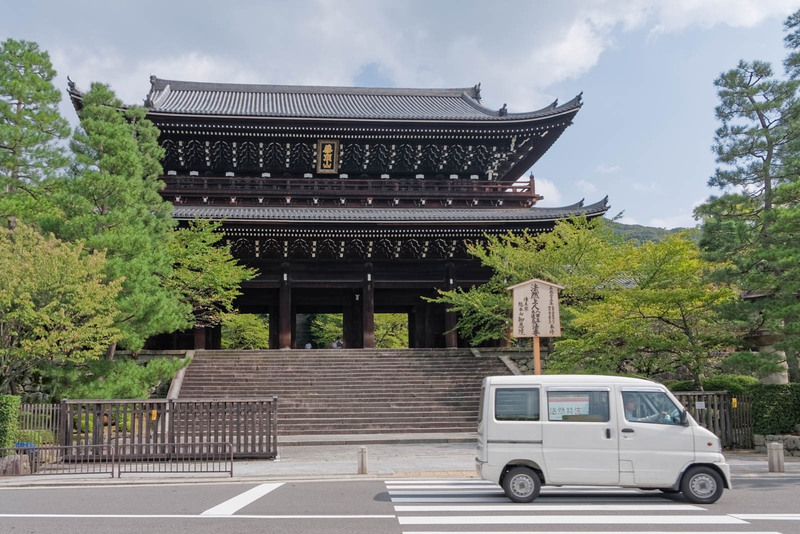 Jingu Michi road is abundant with buddhist temples and shinto shrines that offer a lot to see. 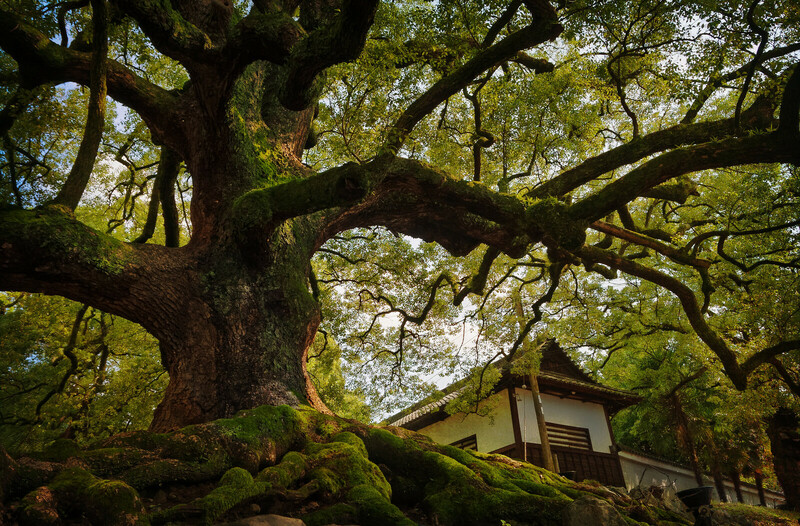 One of the things that drew my attention were these old ancient trees at the Shōren-in temple’s website, a buddhist temple of the Tendai sect. This time we decided to admire the Camphor trees from the street instead of visiting the temple, but it is on my list of places to visit in the future. The entrance costs 500 yen for adults. The processing of this image was quite simple. After some basic edits in Lightroom, I switched over to Photoshop where I removed power lines and other small but distracting objects. Then I opened the image in OnOne Perfect Effects, where I applied a paper texture selectively on the image to emphasize the warm tone and to add some vignetting to it. As you can see from Google street view below, the tree is as magnificent, if not even more spectacular, as it looks in the photo.